The streaming media devices market has been upturned once again – Google leapfrogged to the number two position in terms of new units shipped in 2014 on the strength of its Chromecast shipments, and Amazon has emerged as a force to be reckoned with. 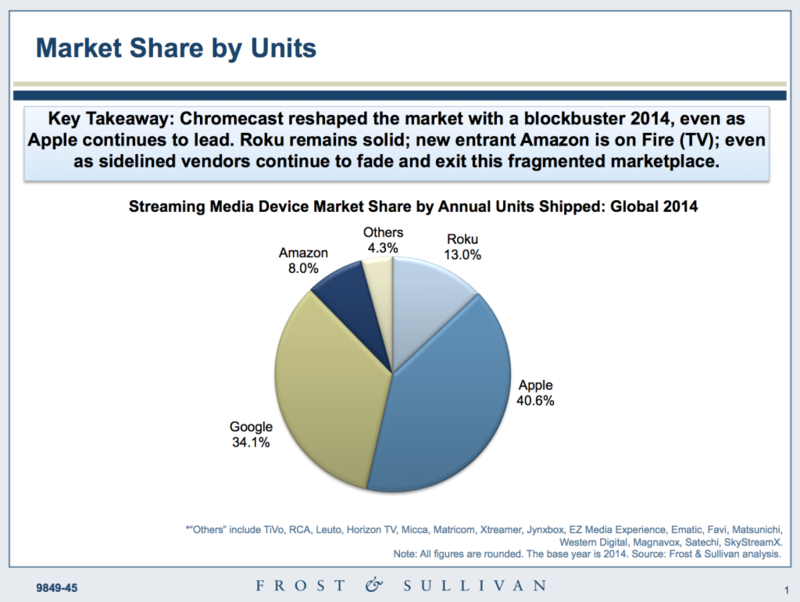 The slide below is an excerpt from Frost & Sullivan’s annual update of the Streaming Media Devices market, and shows how much the landscape has changed since 18 months ago. The study, compiled by analyst Avni Rambhia, details the market drivers, restraints to market growth, product and pricing trends, competitive landscape, and market forecasts and trend analysis broken out by region of the world for the next five years. Numbers are being updated bi-annually to keep pace with changing market statistics. Overall, we found the market nearly doubled in 2014 to ~31M units, propelled in large part by ~10M in Chromecast shipments. We expect the market will grow a further 25% to cross 40M by 2020. Our definition of streaming media devices covers both box and stick form factors, and does not include game consoles which are covered separately. Apple still led the market with 40.6% market share, but Google accounted for more than 1 in 3 shipments and leapfrogged over Roku to take second place in the market by shipments. An aging product design, limited content selection and intensifying competition are challenging AppleTV’s growth. Apple recently announced a price cut to the AppleTV, which coupled with an expected product update this year and a far more aggressive content lineup initiative may help reverse the product’s loss of momentum. For now, however, this is one of the rare markets where Apple’s user experience is not quite at par with more innovative competitors. Roku and also recently Amazon have invested heavily in an easy, intuitive user experience; Roku in particular also boasts a massive channel line-up and a hassle-free search experience. Similarly Google has a reported 17M lifetime shipments under its belt but our research shows that less than half those devices are in active use today – although the level of engagement with in-use Chromecasts is growing. As a result of this differentiation, we are seeing growing divergence between market share measured by annual units shipped and market share as measured by share of total deployed units in use for M&E applications. With the latter metric, Roku clearly stands out, despite its narrow geographical footprint. One of the strongest drivers of streaming media device sales is the skyrocketing consumption of OTT content. That said, this is not in and of itself enough to generate demand for streaming media devices. In fact, the market is fairly treacherous and hence continues to see a steady stream of exits – Sony for example officially bowed out of the market, and TiVo retail numbers continue to dwindle as well. The challenges that are facing vendors in this market and also that are facing content owners who are seeking to capture increasingly elusive viewer attention, are discussed in our study. In addition to streaming media devices, the analysis also breaks out market share and sales numbers for Smart TVs, based on region of the world, with projections for the next few years. Copies of the report are available to any customer who has a subscription to Frost’s Digital Media research service and anyone interested in getting a subscription can email me or Avni Rambhia for more details. Also, while many research analysts at other firms won’t talk to someone unless they are a customer of that firm, I have and always will talk to any company who is interested in getting more details on any aspect of our reports, so email me or Avni Rambhia at any time. You can also call me direct at 917-523-4562.